New Officers of the Man O’ War have been decorated in the University. 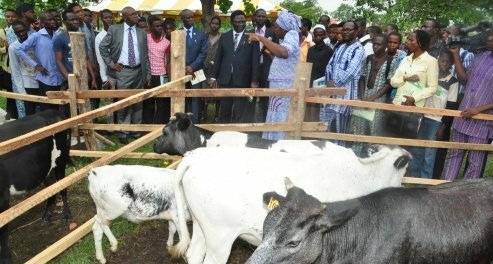 They include Professor Adewale Dipeolu of the Department of Agricultural Economics and Farm Management, College of Agricultural Management and Rural Development (COLAMRUD) and the Director, Centre for Entrepreneurial Studies (CENTS), who was appointed as the new Deputy Grand War Marshal of the Man O’ War, FUNAAB Command. The elevation and dressing was done during the ‘Dressing Day’ ceremony, organised by the club, to honour statesmen and inaugurate new War Marshals. During the occasion, the Acting Vice-Chancellor, Professor Ololade Enikuomehin, who was represented by the immediate past Dean of Student Affairs, Professor Adeniyi Olayanju, appreciated the services of FUNAAB Man O’ War in the University, most especially, during the various ceremonies. He charged members not to rest on their oars and assured them of the University’s continued support. Professor Dipeolu was decorated with the new rank of Deputy Grand War Marshal, as he took over from Professor Segun Lagoke, a former Deputy Vice-Chancellor (Development) and a former Deputy Grand War Marshal, who had retired from the services of the University. The Dean, College of Biological Sciences (COLBIOS), Professor David Agboola, was decorated as Chief War Marshal while 16 statesmen and members of staff of the University, were also decorated as War Marshals. Some of those honoured include Dr. Olubunmi Ashimolowo, Department of Agricultural Extension and Rural Development (AERD), College of Agricultural Management and Rural Development (COLAMRUD); Dr. Christopher Alake, Department of Plant Breeding and Seed Technology, College of Plant Science and Crop Production (COLPLANT); Mr. Roland Iyeh, Directorate of University Farms (DUFARMS); Mrs. Adeola Salami, Department of Veterinary Medicine and Surgery, College of Veterinary Medicine (COLVET); Mr. Mike Ogunji, Department of Physics, College of Physical Sciences (COLPHYS); Mr. Charles Geteloma, Directorate of Public Relations (DPR); and Mr. Adeoye Adeniyi, Community-Based Farming Scheme (COBFAS), among others. Present at the ceremony were the Deputy Dean, Student Affairs, Professor Taofik Shittu; the Commissioner of Police Ogun State, represented by Assistant Commissioner of Police, Bello Tajudeen; the Lagos State Commander of the Man O’ War Command, represented by Comrade Charles Mba; the Controller of Prisons, Ogun State, represented by Mr. Charles Akande; the Sector Commander of the Federal Road Safety Corps, Ogun State Command, represented by Mr. Peter Adepoju; the Commander Vigilante Service Ogun State, represented by Mr. Oluwasanya Adeniyi; the Commander, Traffic Compliance and Enforcement Corps (TRACE), represented by Commander Teslim Adedeji; members of the different para-military; para-medic and voluntary organisations on campus such as the Road Safety Club, Red Cross, Boys Brigade as well as students. Highpoint of the event was the unveiling of the anti-social vices sign-post, which the club hoped would help inculcate good moral behaviour among students.